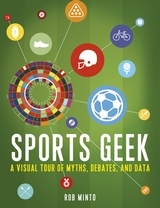 My first book, Sports Geek: a visual tour of sporting myths, debate and data is published by Bloomsbury, and was released into the wild on October 20 2016. You can also read Bloombury’s blurb here. It’s the perfect gift for Christmas. There’s always someone who is a nightmare to get presents for. But I bet they a) like sport b) like to read in short bursts c) like to feel clever. Sport revolves around two things: narrative and numbers. You need the narrative, otherwise why would anyone care about sport? Rivalries, emotions, and sporting legends all require it. But sport also needs numbers. Without them, we have no idea who has won. We need numbers to tell which team is top of the table, or who is the world champion. Sports Geek is a visual and numerical tour through sporting debates and ideas. Teams in all sports use data to create extraordinary analysis of how their players perform, to assess tactics and to get an edge over arch rivals; but fans are rarely presented with challenging and informative data that would help them to further understand sport. Find out why Usain Bolt’s 200m world record is really a big disappointment, whether big sports stars earn more from prize money or sponsorship, learn what the best sport to make a film about is, and what the Flo-Jo problem is. In Sports Geek Rob Minto brings together an encyclopaedic knowledge and love of sport, a rigorous and painstaking understanding and research of statistics with passionate and serious analysis. There’s nothing academic about the way in which Sports Geek is presented, nor the way Rob has unfolded its many stories, but it has been written with the knowledge of an expert with access to cutting edge quantitative analysis and difficult to uncover data. With international breadth and appeal and covering almost every imaginable sport, Sports Geek embraces our global enthusiasm for competitive sport and will arm any sports fan with invaluable information that will give the edge in any sporting debate. Sports Geek is packed with success stories and failures, with anomalies and surprises. What makes this stand out from competing titles is the analysis and contextualisation of the data – in other words, until now it’s not yet been clear why the data is interesting to fans.